"Reduce, Reuse, Recycle" is such an overused (ahem) term that in many ways it's lost its luster. Despite 90% of Americans believing recycling is at least somewhat important, only 58% of people recycle. 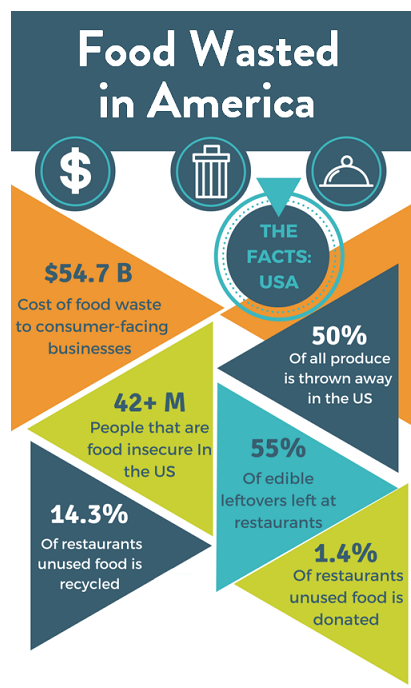 The foodservice industry is well-positioned to significantly reduce the total waste produced in the United States. The US produces roughly 254 million tons of trash annually, with food waste accounting for over one fifth of that total at 63 million tons. This indicates that if restaurants and other foodservice businesses were able to work to reduce their waste, it would have a significant impact. The typical restaurant produces between 25,000 lbs and 75,000 lbs of food waste a year, which isn't just bad for the environment; it also can't be good for your bottom line. 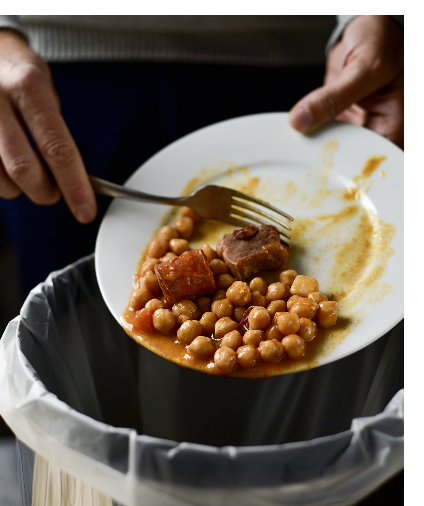 That 63 million tons of food waste is the equivalent of $218 billion! These large numbers can seem insurmountable, but let's break down where to start and what to look at when making decisions. There are two major categories of waste that foodservice providers and restaurants produce, both of which have a big impact on the environment. One is organic material, the actual food product, whether it is spoiled in the kitchen, leftover on a guest's plate, or trimmed and discarded in the preparation process. The second category is the paper and plastic materials, which can include packaging as well as single use items for customers. When talking about personal finance, financial experts typically agree that the first step to cutting back on spending is to find out what you are spending money on. The same principle applies to cutting back on waste. Track what is being tossed, and how much. When it comes to food product, you will need to track waste that occurs before food gets to the customer, and post-consumer waste, like leftover food on a guest's plate after they leave. Tracking can be done manually utilizing paper and pencil forms, however investing in software that helps take care of this would be wise. After all, going through this process is ultimately going to result in saving money. Software that combines waste tracking and management with several other business tools, including pricing strategy and managing inventory between several locations. Once you know the extent of waste you are producing, then you can begin problem solving. Some solutions are basic best practices. Ensure everyone in your kitchen is following "first in first out" procedures, and everything is properly labeled and dated so there is no confusion. Then it's time to get creative. Are there high waste ingredients that can be eliminated or replaced? Would strategically adding specific dishes utilize otherwise wasted ingredients? Are portion sizes consistently too large for your customer base? Can you reduce your waste by adjusting your ordering frequency or quantities? Where full service restaurants may have more food waste, quick service establishments may find themselves trying to evaluate how to reduce single use and packaging waste. Are your trashcans full of plates and cups, indicating people finish their consumables in your facility and thus could have used something reusable? Do you find many unused napkins in the trash or on tables after guests have gone? Would putting napkin holders on the tables or providing some with their order prevent guests from grabbing too many? In the same vein, be cautious of acting too rashly without considering the ramifications of those decisions. Banning straws recently became a hot topic, but consumers were also quick to note that some establishments are replacing straws with plastic lids, which some would argue defeats the purpose. Yet other people question if this is fair to those with disabilities that require straws. Whether or not those detractors should alter the course of this movement is up for debate, but the takeaway is to examine your options from multiple perspectives, even - and at times, especially - when something is trending. Don't allow yourself or your staff to become caught up in the waste reduction endeavor that it comes at the expense of your restaurant's atmosphere or the customer experience. There are waste reduction options for restaurants of every style. Alas, some waste can't be prevented. However, that doesn't mean it needs to go into the trashcan. Forge strategic alliances with local organizations or farms. Food still appropriate for human consumption can go to organizations helping others. (Yes, even prepared foods. Check out the Bill Emerson Good Samaritan Food Donation Act.) Even scraps and trimmings can be utilized by your local farmers feeding livestock. Many organizations or farms would be happy to pick these items up, minimizing or eliminating the inconvenience to you. Good for the environment, good for community relations. And guess what? This is also trackable! Whether it's by hand or, better yet, using software, your business can track these donations. When it comes to single use items, some restaurants simply cannot do without. That is understandable, but be aware that there are still many options to choose from that have dramatically different environmental repercussions. Particularly if it's been awhile since you researched suppliers, you may be surprised what is out there. 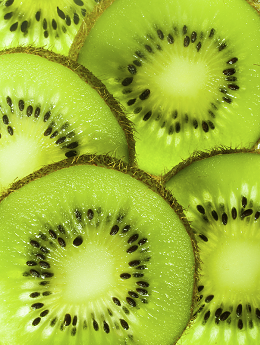 Ideally, your supplier sources ethically. There are several certifications that would demonstrate this quality, including from the Program for the Endorsement of Forest Certification, Sustainable Forestry Initiative, and Forest Stewardship Council. No one can control human behavior, so make your plan easy for everyone to follow. Internally, that means clearly and explicitly communicating all procedural changes, or in some cases reminding staff of existing procedures, to ensure your systems are followed. Ideally, staff members have been involved in the process of making these changes and have alerted you to their concerns earlier in the process, but nonetheless, hear out any concerns and address them head on. Where guests are concerned, communication is also important. Clear signage is essential, particularly for regulars. Staff should also be trained on how to address any questions regarding changes that guests may notice. In some cases, a quick, scripted explanation or question should be implemented so your staff can quickly and easily convey changes. Establishments with a mix of eat-in or carry-out customers may switch to reusable dishware while still maintaining ample single-use stock, in which case customers will need to be asked which they require when they order. "I love ChefTec! I consult it every day and it is the basis of my menu decisions. I can and honestly say that ChefTec is the biggest reason I am still in business after 19 years. It is the one system I have implemented that over the course of the last 17 years has led to my long term solvency and has enabled me to keep the doors open, even through the roughest economic times." Convenience is important to the guest experience, and that should not be underestimated. Examine where your waste receptacles are, and if they are easy to spot and access while seated or exiting your business. If not, customers may be more apt to carry items with them only to litter later. Once you've implemented your plan, let your patrons know what you are doing for the environment and for their community. Nearly three fourths of diners say they care about food waste, so let them know your establishment also cares. Patrons may be more understanding of temporary hiccups during transition if they understand why these changes are being made. This is a big undertaking, but it's one that hugely beneficial to both your bottom line and the environment, and thus the community. If you are considering embarking on this adventure, congratulations! It's a mark of responsible foodservice leader with a mind towards longevity. Joy Pouros works as the authority writer in the Training department at Culinary Software Services, where she writes on topics as diverse as human resource issues to increasing profits. Joy entered the industry working as a Nutritional Aide in the Chicagoland area before moving into writing and consulting. She now specializes in marketing and public relations and writes for a variety of industries.